We tend to build news apps when we have a dataset (or think we can acquire a dataset) that is national in scope yet granular enough to expose meaningful details. A news app should tell a story, and just like any good news story, it needs a headline, a byline, a lead, and a nut graph. Some of these concepts can be hard to distinguish in a piece of interactive software, but they’re there if you look closely. Also, a news app should be generative — meaning it should generate more stories and more reporting. ProPublica’s best apps have been used as the basis for local stories. For instance, take our Dollars for Docs news app. It tracked, for the first time, millions of dollars of payments by drug companies to doctors, for consulting, speaking, and so on. The news app we built lets readers look up their own doctor and see the payments they’ve received. Reporters at other news organizations also used the data. More than 125 local news organizations, including the Boston Globe, Chicago Tribune and the St. Louis Post-Dispatch did investigative stories on local doctors based on Dollars for Docs data. A few of these local stories were the result of formal partnerships, but the majority were done quite independently – in some cases, we didn’t have much if any knowledge that the story was being worked on until it came out. As a small but national news organization, this kind of thing is crucial for us. We can’t have local knowledge in 125 cities, but if our data can help reporters who have local knowledge tell stories with impact, we’re fulfilling our mission. 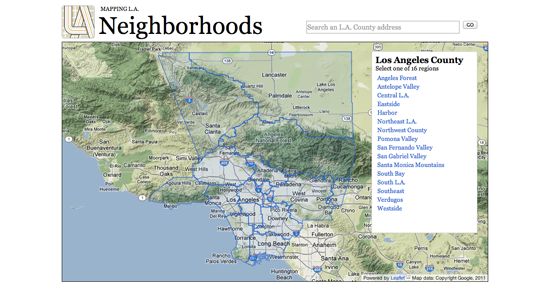 One of my favorite news apps is the Los Angeles Times’s Mapping L.A., which started out as a crowdsourced map of Los Angeles’s many neighbourhoods, which up until Mapping L.A. launched had no independent, widely-accepted set of boundaries. After the initial crowdsourcing project, the Times has been able to use neighborhoods as a framing device for great data reporting — things like crime rate by neighborhood, school quality by neighborhood, etc., which they wouldn’t have been able to do before. So not only is Mapping L.A. both broad and specific, it’s generative, and it tells people’s own stories. The resources necessary to build a news app range pretty widely. The New York Times has dozens of people working on news apps and on interactive graphics. But Talking Points Memo made a cutting edge political poll tracker app with two staffers, neither of whom had computer science degrees. Like most newsroom-based coders, we follow a modified Agile methodology to build our apps. We iterate quickly and show drafts to the other folks in the newsroom we’re working with. Most importantly we work really closely with reporters and read their drafts — even early ones. We work much more like reporters than like traditional programmers. In addition to writing code, we call sources, gather information and build expertise. It would be pretty difficult to make a good news app using material we don’t understand. Why should newsrooms be interested in producing data-driven news apps? Three reasons: It’s great journalism, it’s hugely popular — ProPublica’s most popular features are news apps — and if we don’t do it somebody else will. Think of all the scoops we’d miss! Most importantly, newsrooms should know that they can all do this too. It’s easier than it looks.